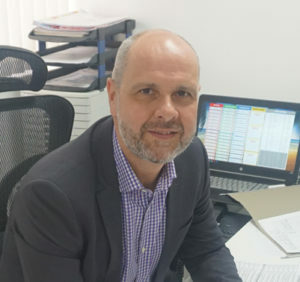 In a rare interview, Parfetts’ joint MD Greg Suszczenia (pictured) tells Cash & Carry Management’s managing editor Kirsti Sharratt about the opportunities he sees for the business. Since Parfetts was founded in Stockport in 1980, it has grown steadily and now has branches in Aintree, Anfield, Halifax, Middlesbrough, Sheffield and Somercotes, as well as Stockport. The wholesaler achieved a record £346 million turnover in the year ending June 2018, up 6.8% on the previous financial year, while profits also grew – from £3.3 million to £5.1 million. How does being a joint MD – alongside David Grimes – work in practice? David’s education and background is accountancy and mine is business management. Broadly, David looks after finance and compliance and I look after trading and strategy; however, we work very closely on major issues, be they problems or opportunities. As well as board meetings and management meetings we speak most days and have a lunch off site monthly. One of the best things about the joint MD set-up is that we share external duties. For example, I sit on the Unitas board and David sits on the Employee Ownership board. This ensures we both have enough time for the day-to-day business, which is at the heart of our success and focus. How has your work changed – if at all – now that Steve Parfett has retired? Steve sold the business 10 years ago and stepped down as MD eight years ago. At that point, David and I had been making all strategic decisions and developing initiatives together to take the company forward as well as repaying the family. Steve and his sisters were on the board up to the end of last year when the final payment was made. The family were supportive of me and David throughout this period. How does the employee ownership model work and what benefits has it brought to the business? Employee ownership is an ever-evolving process. Structurally we have elected councils at each depot called Employee Voice. These meet independently at each branch, and engagement varies across the estate. Every six months each depot council is updated on the company’s financial position by David and is also given a topical presentation by another director or head of department. As many staff as possible are encouraged to attend. Each depot council has a chairman that sits on the central council, and that in turn votes for two members to sit on the Employee Trust Board with me and David and an independent chairman. The normal board runs the business but the trust board is kept up to date with finances and votes on any major investment or change that could affect the staff and company. • Transparency and communication are now company policy which I think is great. • Tax-free status for any company-wide bonus is obviously a very visible benefit for all staff. • In most instances the move to any employee ownership model is a way for the founders to extract wealth locked in the company by selling to staff rather than a competitor. This is obviously a good thing but it makes the early years of employee ownership extremely difficult as there is often debt associated with that purchase as well as cash extraction. However, if you get through the tough early years it means freshly accumulated wealth of the company can stay in the company and be used to reinvest and grow. 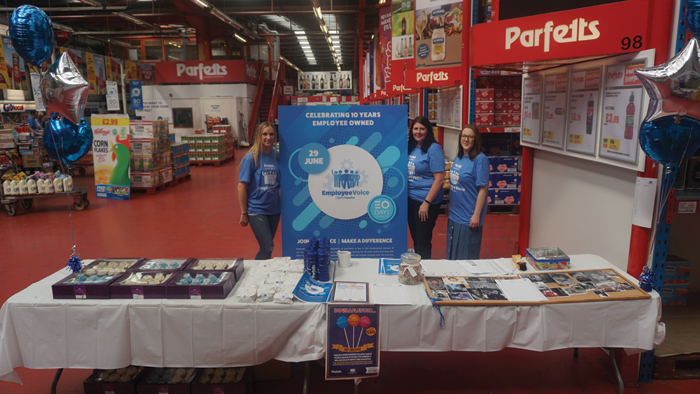 Last year Parfetts celebrated 10 years of being an employee-owned business. How did the borrowing required for the transition to employee ownership affect investment in the business? We have paid off the family in full but still have some bank borrowings that were taken out to do this. However, the ongoing payments reduced significantly when we restructured the financing last year. The Middlesbrough depot (formerly Blakemore’s) wasn’t really much of a dent to cashflow and our post-purchase investments haven’t been onerous. Granted we were cautious at the time Blakemore Wholesale was put up for sale because we were re-engineering our finances to exit the family. If the sale happened this year, I think we would have been a little more bullish regarding other sites. Has the demise of Blakemore’s C&C division helped your business in other ways? Yes it has. Most directly it has been in North Wales; elsewhere it’s harder to understand due to other customer additions from Bargain Booze and P&H. Unfortunately we have no real presence in the Midlands where the greatest benefits were to be had. What are the other recent developments at Parfetts? • We have created a new department called Digital Suite to recognise and develop all things digital. Our digital focus has been shunted from ‘bolt on’ to ‘front of train’ and the relaunch of our websites and apps are scheduled for this month. My ambition is to catch up with competitors on digital but then start to pull away from the pack by using our flat structure and closeness to our customers to create something really special. The opportunity for upweighted sell, personalisation, gap fill, advertising, trend capitalisation, targeted communication, specialisation (I could go on) are overwhelming. • Andy Whitworth (wholesale director) and Jason Bernard (operations manager) are currently investing in our larger sites by physically reshaping them to cope with the dual needs of delivered and traditional cash & carry. • The board continues to pursue possible external opportunities to add to or complement the core business. • Fascia development continues to dominate the way we attract new business from the existing infrastructure. • We are seeding ‘The Local’ – our new offering for the on-trade in Merseyside – to launch elsewhere once we are happy with the package we have to offer. • GOLD (GO Local Direct) is our full delivered model that sits within an existing branch but delivers outside its natural catchment. We started this at Sheffield where GOLD sales are now hitting £25 million per year – that’s in addition to the branch’s £55 million turnover. Sheffield is now a 24-hour operation functioning as a cash & carry by day and a regional distribution centre by night. Our Somercotes branch is now developing the GOLD model to stretch our reach further south. • A few weeks ago, we had our first Go Local ball, where we brought customers and suppliers together for a trade show followed by an evening’s entertainment. I loved this event that Guy Swindell (retail director) set up and we are looking to double its size next year. The show proved to me we are close to our customers but could be even closer, and we must finally develop regular branch workshops for our fascia customers. What is the latest position with Go Local? We now have more than 400 stores from Wales to Hull, Newcastle to Birmingham and the pipeline is strong regarding our goal of 1,000. The template works here but Guy Swindell is exploring what the future looks like by creating a concept store near to our head office. Do you still own two retail shops and does your wife Bev still run them? It is best to describe my shops as my wife’s as I have no real involvement. She did feel the pain of many of our customers when a Co-op opened 200m from her main shop three years ago and sales halved overnight. 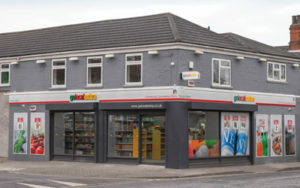 The store still exists but with Parfetts’ help it was rebadged as a specialist off-licence, Greenhill Wines, and my wife uses it to fuel her gin hobby! The other shop is a post office. Because I live in Lincolnshire I spend Mondays and Fridays working from branches to the east of the Pennines. This means I visit the branches as well as having various meetings – usually one of these will be with one of the major brewers. This keeps me close to the action as we must never forget that buying and selling is still at the heart of what we do. I sleep over in Stockport on Tuesday and Wednesday nights which means I spend three days at head office to deal with all other meetings, measurements, updates and issues. Bolted on to this framework are visits to other branches, Unitas, off-site top-to-top meetings and conferences. What is your longer-term strategy for the business? The original Parfetts business gave careers to one generation and I would describe my life as trying to create a business that can do it for another. Additionally, I truly believe that we are in the midst of an industrial revolution akin to the last one. Technology and trends are moving so quickly that only flat management structures that can adapt quickly will survive. The only constant is change and once you embrace this proposition it’s quite enjoyable. David and I are excited but cautious about the future: a career in wholesale does that to you. The best thing is that because we couldn’t expand for over a decade it made us really focus internally and create home-made ways to grow the business. These strategies are now well established, which means we can grow without expansion. On the other hand, we can expand if the right opportunity presents itself. Obviously, the focus on sales growth doesn’t go away but improved profitability is now just as passionate a focus because retained earnings can now serve the business of the future as opposed to repaying the business of the past. In the relatively near future, I would see us having over 1,000 fascias, more depots, multiple digital offerings and over 50% of our order receipts online. What concerns do you have about the future of the industry? The consequences of Brexit are obviously worrying but compared to a lot of businesses we are relatively well insulated to most outcomes. The duty fraud beer market was a major problem for many years and I am concerned that as time evolves this will creep back due to lack of government resource and focus. The takeover of Booker by Tesco, together with other competitor movements, will continue to challenge us but doors seem to open and close in this ever-changing retail environment. How do you feel about the creation of Unitas and the progress it is making? We are really pleased with the progress being made. Although as a large member the benefits aren’t enormous, I’m pleased that independent wholesale is now represented to suppliers as one body – and a very big one at that! Diversity and individuality are the future of society and these new entrepreneurs will need to be serviced by strong wholesalers. On a personal note I have a lot of respect for every member of the Unitas board. There are some amazing characters and competitors in that room and yet the cordiality and professionalism are faultless. This is what makes our channel so great to work in. Married with two sons aged 18 and 16, Suszczenia (who incidentally was the childhood neighbour of Cash & Carry Management’s Kirsti Sharratt!) enjoys activity-based holidays like sailing and skiing.